Literary theorists discuss the pervasive dichotomy of the Self/Other, apparent across various epistemological categories such as gender, race, class and religion. Among other things, they discuss this as a projection of the Self’s fears and desires onto the Other as a means of concretising and thereby mitigating these anxieties. The Self thus constructs its identity based on perceived differences with its Other. This paper suggests an intersection between the Othering of the Orient and women, in which the Orient is cast as the feminine, traditional Other against the masculine, Occidental Self tied to modernity. This is seen from the way Western cultural discourses, especially those of art and literature, traditionally used women as a metaphor for the Orient. As a result, postcolonial and feminist art often saw a dismantling and rewriting of European historical and fictional record. It is therefore curious to note that in post-independent Singapore art, the Balinese woman was and is not only still a major muse in locally produced works, but she continues to be portrayed through a gaze that is akin to that of the colonial male. Using a quasi-psychoanalytical framework and other relevant fields of enquiry, this paper analyses various key local paintings of Balinese women and shows how the consumption of such images is a result of (i) Singapore’s unique history as a (post)colonial nation; and (ii) the way in which the Balinese woman serves as a site for the projection and mitigation of Singapore’s postcolonial anxieties for both the artist and viewer through the effect of doubling. 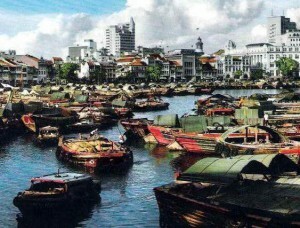 With regards to (i), I argue that Singapore presents itself as a unique study in postcolonial Asia because, unlike other countries, it is arguably a creation of colonialism; that is, there was no pre-existing culture or form of government before it was founded in 1819 – or at least, none that were entrenched enough to survive during and after British rule. Thus, local art did not aim at rejecting Western modes of artistic expression, but strove instead to integrate both Western and Eastern schools in order to create a representative Singaporean style. However, the inherent contradictions in ideologies and perceptions of the Orient gives rise to tensions that are manifest in the paintings themselves. Having established this premise, the paper then proceeds to examine how, through the process of reflection and symmetry, the Balinese woman becomes the double of the colonial male viewer which erases any difference the Self claims to have over the Other. The simultaneous masking and unmasking of these postcolonial anxieties, as well as the Balinese woman being both the realisation and mitigation of these anxieties is analogous to the perceived difference that separates the Self from its Other as being both its repressed fear and desire. This paper will conclude by showing how the Othering of the Oriental female in art therefore stems from a deep-rooted fear of being viewed by the modern (western) world as traditional, feminine and Oriental; as well as the repressed desire to embrace this same view of itself. This entry was posted in Social and tagged female, Singapore, women on 05/02/2018 by Mary.